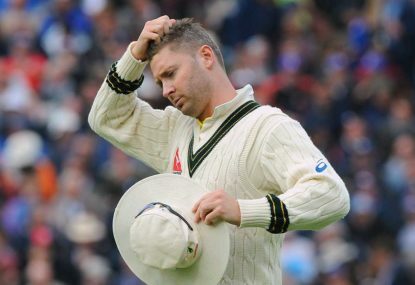 I wonder, if Michael Clarke could have his time again, would he change the comments that he made on Macquarie Radio? 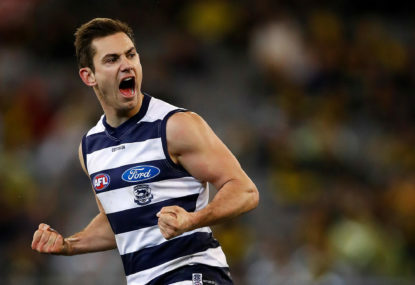 After Geelong delisted Daniel Menzel, a number of clubs are thought to be considering picking up the 73-game free agent. 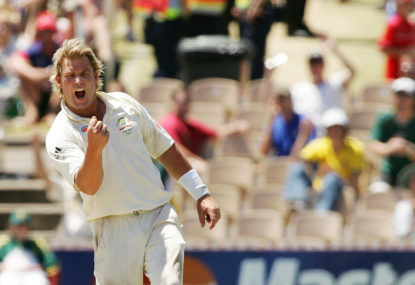 The unabashed celebrity of Shane Warne’s running commentary on ‘Australian cricket’ belies the dangers of peroxide blonde tips leaking into the central nervous system. Interesting how Clarke’s right of reply to Whateley has all the hallmarks of the arrogance which underlined his initial thoughts on Macquarie Radio. A what can only be deliberately misspelt “Gerald Wheately”, condescensions on Whateley’s personal cricketing ability and then the lack of common awareness to remember that the Australian cricket team was caught blatantly cheating. The fundamental problem here is that Clarke remains within the CA bubble of former players, and now media personalities and administrators, who refuse to acknowledge that a team culture that essentially condoned cheating as acceptable behaviour needs to be completely overhauled and stripped back. The win at all costs ideology of ‘tough Australian cricket’ is THE reason behind the current malaise of the national team and needs to be removed root and stem. I would love to see the Spring Tour incorporate a test match (potentially 2) against one of the Pacific nations. With so many of their players in Europe, it could be a great way to give Test experience to the travelling development players and test new combinations in problematic areas (the 2nd and back rows, the midfield etc). The pressure to perform in the Rugby Championship and one-off mid season Test series has shown that Cheika isn’t willing to experiment in games that ‘matter’. Perhaps this would give players like BPA, Gordon, Powell, Petaia and Banks the chance to shine? God, anything to inject some desperately needed spark into the Wallabies outfit. Even a different team against Italy is better than rolling out the same stale combinations. Taberner is definitely underrated outside of WA and Cox looks like he’s progressing nicely- there’s been some talk that he may get swung back though? Since we’re on the subject – what do you think the best make up of Freo’s talls will be? Assuming for the sake of this, that all are fit. Can Lobb, Darcy and Sandilands all play in the same team? Hi Bill, my article challenges the ‘boy’s club’ establishment that existed at Channel 9 and now has the potential to transfer itself to Fox and Seven – in this respect I am seeking to improve the sport by arguing for commentators to have the requisite analysis, narration and media skills, rather than a commentary position based purely on past playing success. This does not diminish their playing careers or achievements. There are plenty of superb commentators who haven’t excelled in their chosen sport – Jim Maxwell, Alison Mitchell, Harsha Bogle, Gerard Whateley, John Arlott, Geoff Lemon et al. Jonathan Agnew and Alan McGilvray are two others that have arguably exceeded their sporting achievements when in the commentary box. I believe that in the case of Channel 9 there was too little an opportunity for those with the broadcast skills to be positioned alongside former players. Perhaps 7 and Fox will do a better job with a clean slate. WC are going to be a successful club for the next few seasons and picking up a player like Menzel is low risk, high reward. They won’t receive top end draft picks for the next few seasons so bringing in a mature body like Menzel is surely a better investment than whoever they draft with their 5th round pick 94 (if they indeed use it). Perhaps he takes the spot of someone like Jake Waterman, but he offers something similar to LeCras with his prowess around goal and general forward 50 craftiness. It’s been easy to bag Freo the last few seasons, but scoring has definitely still remained a problem. How they decide to structure their forward mix is intriguing – surely Mundy and Walters spend more time back in the midfield with Neale departing? Ballantyne hasn’t found the form of yesteryear and Matera has been underwhelming. Vis-a-vis WC: he doesn’t replace any of the existing forwards, but with LeCras retiring does he offer something similar? He’s a mature body with good goal nous and is a low risk high reward opportunity. WC won’t have many high draft picks over the next few seasons if they remain successful so getting creative with list management becomes imperative. 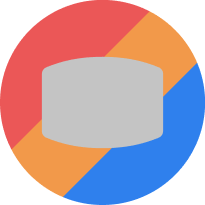 A few very good criticisms in regards to language clarity – my fault entirely when submitting rage pieces immediately. Shaun Marsh definitely deserves to remain in the team as an experienced head, I just wasn’t particularly clear in hindsight. Thanks for reading and more importantly, engaging though.